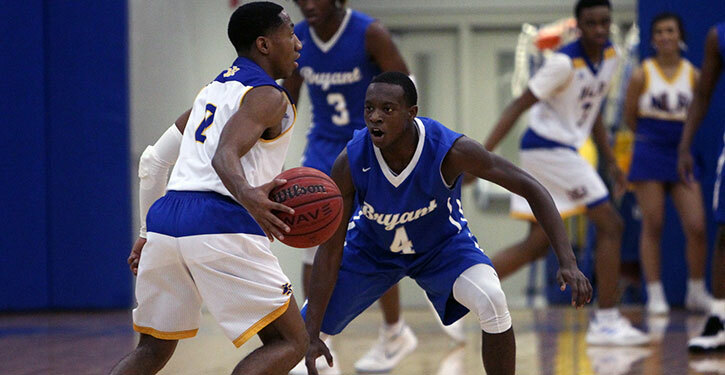 NORTH LITTLE ROCK — Since they started playing regularly during the 2002-03 season, the Bryant had never defeated the North Little Rock Charging Wildcats at North Little Rock. In fact, Bryant hadn’t beaten the Wildcats in seven consecutive meetings, dating back to the 2011-12 season when the Hornets prevailed at home on Senior Night 45-38 on their way to a playoff run to the State semifinals in head coach Mike Abrahamson’s second season at BHS. 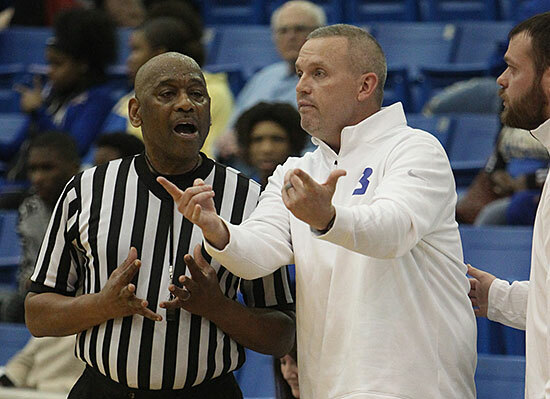 But, on Tuesday night, in a battle for a share of first place in the 6A-Central Conference, the Hornets finally did it, with a convincing 73-56 victory, in a game in which they never trailed. Khalen Robinson poured in 24 points, Camren Hunter had 15, Treylon Payne 14, A.J. Jenkins 9 and Catrell Wallace 8 (to go with 10 rebounds and four blocked shots). North Little Rock’s lone double-digit scorer was Spencer Simes with 20. The Hornets, along with some foul trouble, limited star Collin Moore to 6 points and 10 rebounds. 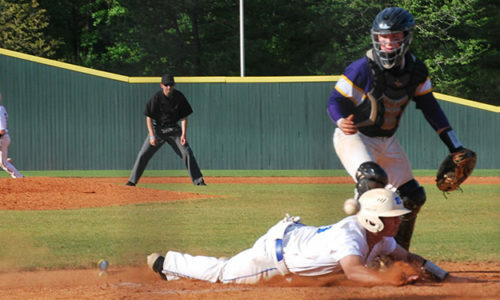 It was the Hornets’ 11thwin in the last 12 games, their fifth in a row, and they retained a share of first place, while knocking North Little Rock out of a first-place tie. 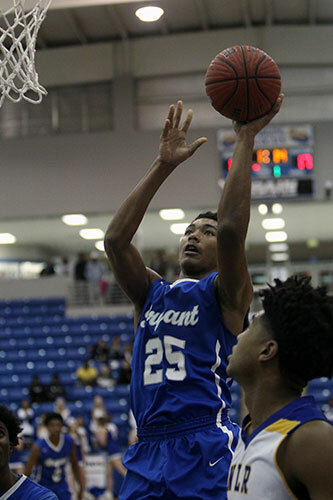 Conway, whom the Hornets host this Friday, remained tied with Bryant atop the league with a 62-55 win over Little Rock Catholic. The Hornets were relentless. They shot the ball well, matched the Wildcats on the boards 33-32 and, on defense, forced 17 turnovers and took five or six charges. They hit their free throws. 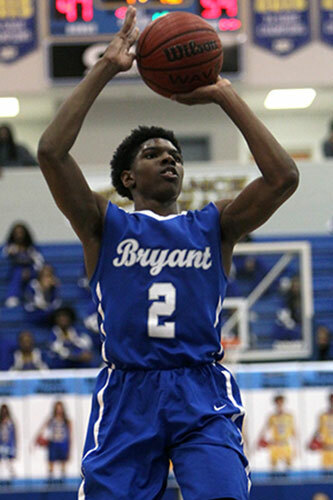 Bryant was 17 of 23 from the charity stripe, 9 of 11 in the second half, while North Little Rock was 10 of 18 for the game. “We just treated it like every other game,” Abrahamson said. “We try to prepare the best we can for every opponent. No matter who it is. We know North Little Rock. We know their reputation. 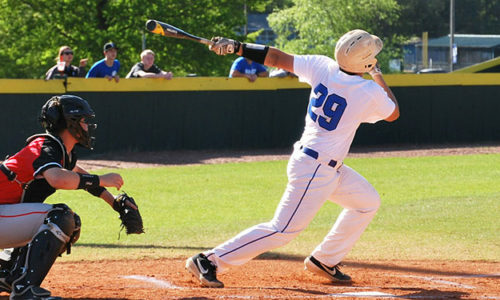 We know what they’ve done the last six years, winning four of the last six (State championships). The game was tied 5-5 when Wallace grabbed the carom off a teammate’s miss and scored to put the Hornets ahead for good at the 4:07 mark of the first quarter. Rodney Lambert followed with a three-point play on a dish from Khalen Robinson. Two free throws by Hunter was countered by Mekhai Washington’s 3 but Khalen Robinson answered with a triple. Hunter made a steal and followed his own miss to make it 17-8. Simes and D.J. Smith scored North Little Rock’s first back-to-back baskets but, in the final minute, Jenkins drilled a 3 to make it 20-12 going into the second quarter. And when Payne scored on a driving jumper then, off a defensive board by Hunter, drained a trey, it was 25-12 and North Little Rock needed a timeout. Decory Watkins knocked down a 3 to make it 25-16 but Jenkins took advantage of a mismatch defensively and drove for a three-point play. Otis Jordan hit a free throw but Khalen Robinson nailed another troika. Moments later, he fed Jenkins who wound up with another three-point play. Hunter made a steal and a pair of free throws so, with 4:12 left in the half, the Bryant lead was 36-17, the largest of the game. Sparked by the return of Moore, who got into early foul trouble and had to come out, the Wildcats rallied. Simes hit a 3 at the buzzer and the Hornets’ lead was 37-28 at the half. 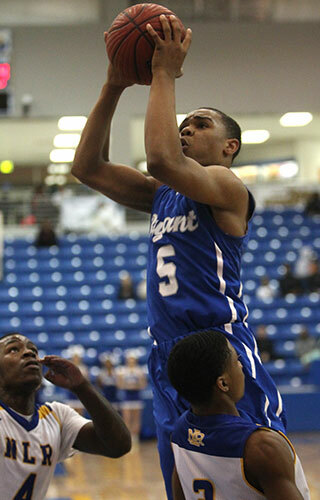 And when Shawn Fudge opened the second half with a 3, North Little Rock was just 6 down. But before the Charging wildcats could score again, the Hornets had pushed the margin back to 11 with a run capped by Khalen Robinson’s third triple. Fudge interrupted Bryant’s surge with a three-point play but, quickly, the Hornets were attacking the basket again. Payne scored on a drive to the rack then Robinson came through with back-to-back old-fashioned three-point plays, extending the margin to 52-34. By the end of the third quarter, however, North Little Rock had whittled the margin to 12. It was 52-40 going into the final period. The Hornets opened the last quarter with another flurry. Wallace hit a free throw after being fouled on an offensive rebound. North Little Rock turned the ball over and Payne hit a layup. Tracy Steele interrupted with a basket for the Wildcats but when Robinson and Wallace each scored again, the Cats called a timeout, trailing 59-42. And they were starting to bicker with each other. Down the stretch, North Little Rock cut the lead to 12 twice but could get no closer as the Hornets answered every challenge. In the end, they spread the floor. Hunter added a pair of free throws and Payne hit a layup off a feed from Robinson to set the final score. Holding North Little Rock to 56 points was key and it wasn’t just slowing down Moore. “It was more containing the ball,” Abrahamson said. “They push the ball so hard, after a make or a miss. They’re so good at what they do, we couldn’t stop all of that. They still shoved it right down our throats a few times. That’s something we’ve still got to get better at, although we did a pretty good job. “That and rebounding,” he noted. “We just tried to limit their easy baskets, their penetration baskets, limit our turnovers so they’re not getting those kinds of baskets, and offensive rebounds. Payne 6-16 0-0 14, Kl.Robinson 9-14 3-4 24, Lambert 1-8 1-1 3, Hunter 3-8 9-10 15, Wallace 3-5 2-6 8, Jenkins 3-4 2-2 9, Ks.Robinson 0-2 0-0 0, Martin 0-0 0-0 0. Totals:25-57 (44%) 17-23 (74%) 73. Jordan 1-4 1-2 3, Watkins 1-3 0-0 3, Simes 7-13 3-3 20, Fudge 2-6 1-3 6, Moore 2-7 2-3 6, Washington 3-3 0-0 7, Smith 1-6 2-4 4, Steele 1-2 1-3 3, Cotton 1-1 0-0 2, Williams 0-1 0-0 0, Frszier 1-4 0-0 2, Shaw 0-0 0-0 0. Totals:20-50 (40%) 10-18 (56%) 56. Three-point field goals:Bryant 6-16 (Kl.Robinson 3-7, Payne 2-7, Jenkins 1-1, Lambert 0-1), North Little Rock 6-17 (Simes 3-3, Fudge 1-3, Watkins 1-2, Washington 1-1, Frazier 0-3, Moore 0-2, Smith 0-2, Williams 0-1). Turnovers:Bryant 10, North Little Rock 17. Rebounds:Bryant 13-20 33 (Wallace 4-6 10, Kl.Robinson 1-6 7, Hunter 3-2 5, Lambert 0-3 3, Payne 1-1 2, Jenkins 1-1 2, Martin 1-0 1, team 2-1 3), North Little Rock 11-21 33 (Moore 2-8 10, Jordan 3-3 6, Washington 2-2 4, Simes 0-3 3, Fudge 1-2 3, Steele 1-0 1, team 2-3 5). Team fouls:Bryant 16, North Little Rock 21. Fouled out:North Little Rock, Fudge. Technical foul:Bryant, Wallace.